Yakutia has all the makings of a major tourist destination: hellish cold, warm vodka with frozen hors d’oeuvres, baked horsemeat and plenty of exotic character. 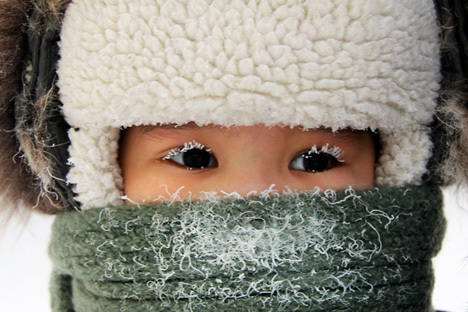 Temperatures the second weekend of December in Yakutia are well below -30° Celsius (-22° F), that is, warm. Ordinarily, this time of year, temperatures drop to around -50 C. One can get used to anything. Besides, thermal underwear, a hat, down parka and gloves will not allow you to perish on the frozen streets. Nevertheless, dressing for any venture outside is like dressing for a walk in open space. The cold burns physically wound your face. If you disdain ski pants, the cold, like a living creature, will cling to your legs; your jeans will freeze to your knees. But even if you do wear the ski pants, they won’t do you much good. Meanwhile, local residents are ready to hang out with each other in the freezing cold for hours. Street festivals are a common occurrence, to say nothing of the fact that Yakuts love to spend their leisure time in the open air — hunting, fishing, engaged in street works. All in all, it’s a matter of habit. In December the republic of Yakutia — the largest region in Russia (more that 3 million sq. kilometers, the size of five Frances or one India) and one of the least populous (less than one million inhabitants) — holds a festival called Winter Begins in Yakutia. The festival’s two main events are meetings with Ded Moroz (the Russian Santa Claus) and with Chys Khaan (Yakutia’s folktale hero responsible for the cold) and the Stroganina Festival. It all looks rather fantastical. Chys Khaan, Yakutsk’s Ded Moroz, was invented long ago by adapting local legends about the Winter Bull, a horned symbol of the ruthless elements. The result was a kind, but scary and bearded old man who looks like the sensei in Quentin Tarantino’s “Kill Bill”, only in a hat with enormous horns. Chys Khaan lives in a cave dug into the permafrost where it is always -7° C, both winter and summer. Inside there are permanent ices sculptures, including copies of the Venus de Milo, Picasso’s “Guernica” and works by the ingenious Buryat artist Dasha Namdakov. There’s also an ice bar. The ice bar is an attraction that was conceived right here, although it does exist in several other places, rumor has it, in London and in Moscow. But here it is right in situ. Vodka and champagne are poured into shot glasses and glass flasks carved out of ice. To go with the iced drinks there is stroganina: raw fish that has been frozen right after being pulled out from under the ice and then cut into paper-thin slices with a sharp knife. These frozen slices are then dipped in salt and pepper — and, honestly, mankind isn’t likely ever to come up with a better accompaniment to vodka. Yakuts eat almost no pork and are not overly fond of chicken, but they love venison, cow and horse meat. The flesh of colts is a staple food among these northerners descended from Turkis who wandered so far north either from Mongolian nomads or the Golden Horde or from Tibet, even the Yakuts themselves don’t know. Well, horse meat is truly delicious, although a little shameful, especially if one rode the horse before eating it. The Stroganina Festival kicks off with a preliminary contest among teams who present towers and other constructions made out of stroganina to a panel of judges. This year the most beautiful composition was of a mammoth — an unofficial symbol of the region. Then comes the main competition: teams of two, a man and a woman, must quickly cut frozen fish and create a tower on a dish. The man cuts, the woman creates. The result is judged for time taken and for beauty. The expert panel is made up of respected fisherman, eaters and city officials. Meanwhile, in the hall one may buy fish, knives, fabulous dresses, hats and gloves made out of fish skin, and caps made out of horse hair. One may taste stroganina and other local foods. Between competitions local dance groups perform: boys and girls illustrate various pastimes (catching fish, hunting bears, sorcery and courtship) with their dances. And it’s often hard to distinguish one pastime from another, as in life. Then pretty Yakut girls appear modeling locally made fur coats. Some of the coats are very short and so one discovers that Yakut girls have more than just pretty eyes. Everyone is wearing traditional costumes. Beautiful woman are draped in silver. On festival days Yakut women decorate themselves with all manner of adornments which in sum may weigh up to 17 kg (7.5 lbs). In everyday life, incidentally, there is at least one element of traditional dress which Yakut men and women always wear: high fur boots made out of deerskin, sometimes decorated with beads. They are expensive and very, very warm. The desire of the local authorities to turn the republic of Yakutia into a tourist destination has met with different reactions: the image of savages in deerskins, dances and stroganina, guttural singing and shaggy horses is all very well, of course, but in Yakutia there are also research institutes, including the Institute of Permafrost, Russia’s northernmost university, complex production lines, oil, gas, diamonds, gold and uranium. In the capital city of Yakutsk high-rise buildings are being built on the permafrost — in place of a foundation, posts are hammered in. Yakutsk boasts one of Russia’s best programs to support the disabled: even low-rise buildings have elevators for wheelchairs, and almost all public buildings are equipped with ramps. Indeed, Yakutsk is an absolutely civilized city. Meanwhile the authorities are presenting it as though it were a remote village inhabited by nomadic hunters and gatherers. The logic of the local authorities is entirely transparent. Few people like industrial tourism, and even those few enthusiasts would never be allowed to see a uranium mine or a diamond factory. But many people like exotica, national traditions, shaman spirituality and stroganina with vodka. They are the ones who will come to Yakutia as tourists. In any case, that is what the government of this marvelous republic is hoping.